Hike to a mysterious stone wall, a historic fire lookout tower, and incredible overlook views into the Cohutta Wilderness at Fort Mountain State Park in North Georgia. A mysterious, 800-foot-long stone wall of ancient (and disputed) origin. A 1930s, four-story, castle-like stone tower. And one of our favorite, most beautiful, sweeping views in North Georgia. This hike packs in a ton of interest and natural beauty on its relatively short, beginner-friendly distance, and visits of the best views in all of Georgia’s State Parks. This 1.5-mile loop explores many of the highlights of Fort Mountain State Park, combining three trails to visit the park’s most popular destinations. It’s beautiful year round, for sure – but especially so in autumn, when fall’s colors paint the forest in beautiful shades. And sunsets from the observation deck are nothing short of incredible… just be sure to leave time to get back to the trailhead before dark. 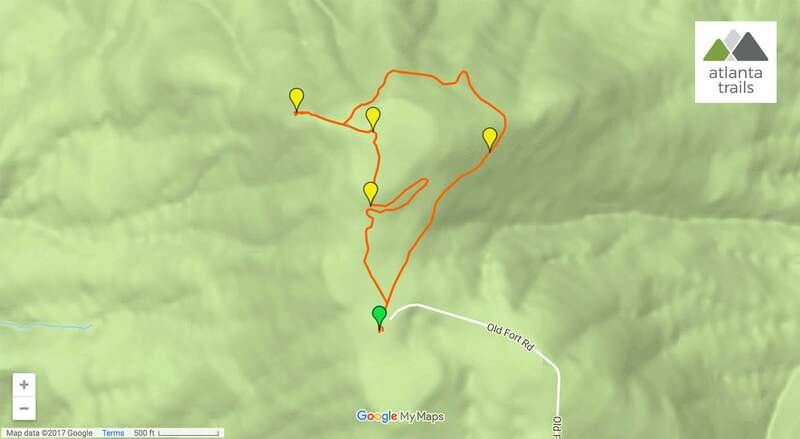 The adventure begins at the park’s mountaintop-area trailhead (view maps and driving directions), following yellow blazes in a northeast arc through a rocky, mossy hardwood forest. The rolls elevation gently, crossing through a tumbled slope of lichen-covered boulders at .3 mile. The hike passes a junction with a red-blazed side trail that connects to the Fort Mountain Gahuti Trail. This route continues straight, following yellow trail blazes in a loop around the mountain’s summit. 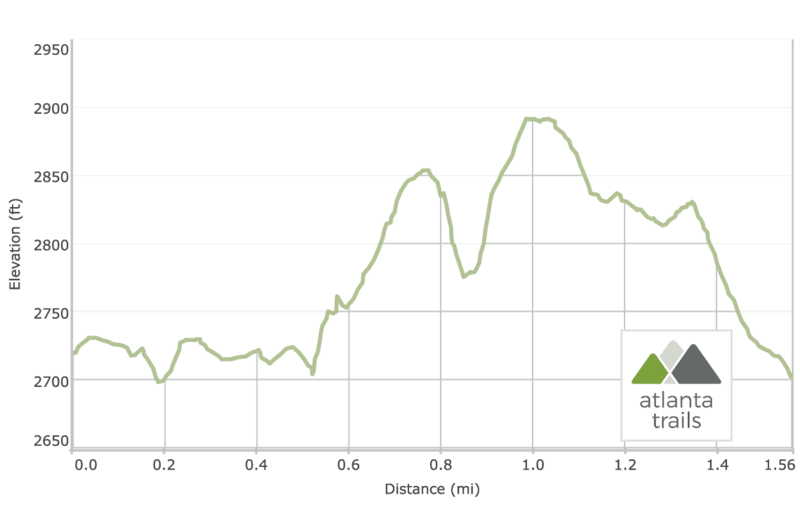 The trail arcs westbound at .45 mile, beginning a steady elevation climb through a boulder and fern-filled forest on the mountain’s northern slope. Views open through the tree cover on trail right as the hike continues to gain elevation, and a stone outcrop at .5 mile offers limited views of the adjacent ridge. The hike meets a signed trail junction at .8 mile, turning right. The trail descends to the mountain’s overlook, dropping elevation on stairs and landings bordered by massive tumbled boulders. The panoramic vista opens up after descending the stairs, revealing an incredible, sweeping wide-angle view of the surrounding mountains and plains. Towering mountains frame the view to the left and the right, stretching into Georgia’s beautiful, remote Cohutta Wilderness. If you look carefully, you can spot the nearby Grassy Mountain fire lookout tower on the neighboring summit to the right. Open, abundant plains of trees and farmland stretch ahead. Birds of prey soar silently above in the thermal uplifts flanking the ridge. It’s easily one of the best long-range views we’ve seen in North Georgia. 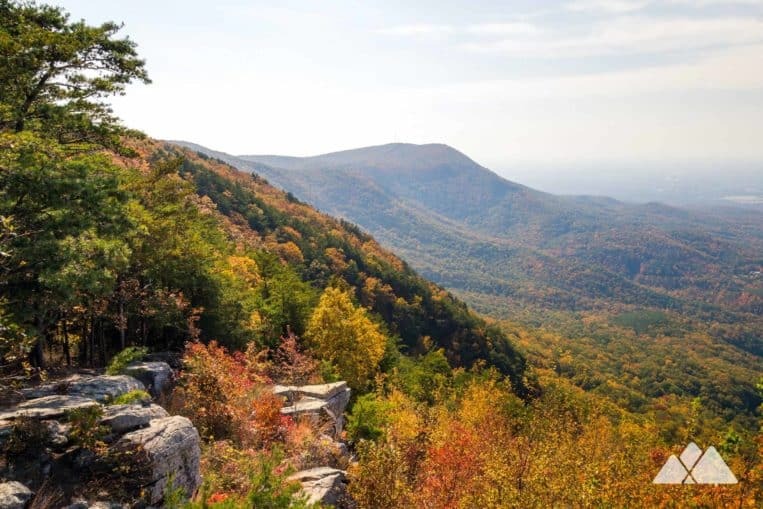 Views from the Fort Mountain overlook are particularly stunning in autumn, when leaves on the surrounding peaks and the sweeping valley erupt in a colorful spectrum of yellows, reds, and oranges. The hike departs the overlook, retracing its steps to climb the stairs and return to the yellow trail intersection. This hike follows the red-blazed trail straight through the trail junction, ascending steadily and approaching a clearing. The trail reaches the castle-like tower at 1.2 miles. 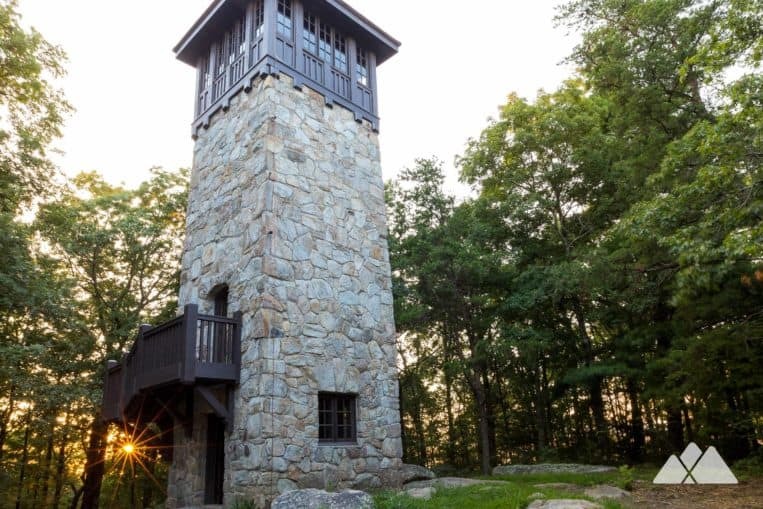 The four-story tower, built in the 1930s by the Civilian Conservation Corps as a forest fire overlook, stands at the crest of the mountain’s summit. Departing the tower, the hike follows a trail due south toward the rock wall, reaching the wall at 1.3 miles. 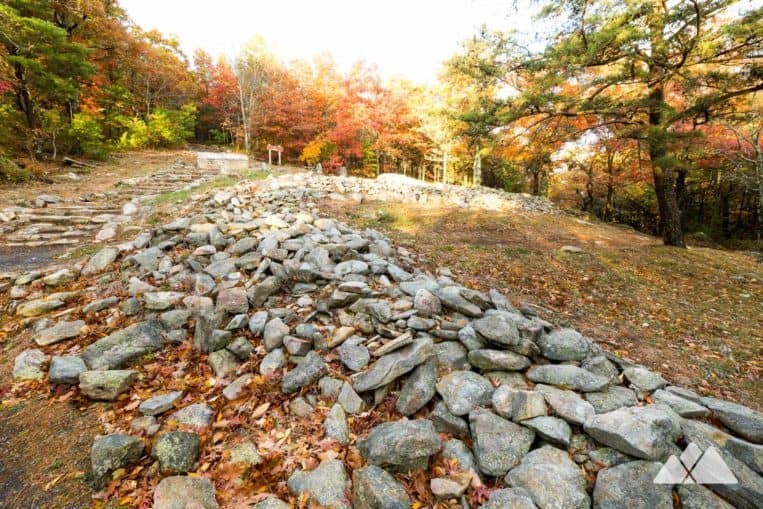 The stone wall winds in a serpent-like curve, stretching 885 feet in length. Its origins are shrouded in mystery, thought by archaeologists to have been built anywhere from 500 to 1500 AD. Its builders are shrouded as well, believed by some to have been early Welsh explorers, and by others to have been Native Americans. The wall’s construction varies from small rocks to enormous boulders, rising as high as 6 feet and winding as wide as 10 feet along its enormous length. Whoever built the wall was determined: construction must have been a pretty significant effort, and the wall’s significance must have been important. The hike turns left to follow the wall’s winding contours to the east, meeting a trail junction at 1.45 miles. The hike turns right at this junction, following the Fort Mountain Trail southwest along the wall’s southern contours. The trail departs the wall, descending a series of stone stairs in a southerly direction toward the trailhead. The hike reaches the parking area at 1.6 miles, finishing the adventure. This park is easily one of our all-time favorite destinations in North Georgia. There’s a ton to see and do in the park, with nearly 40 miles of equestrian, mountain biking and hiking trails. 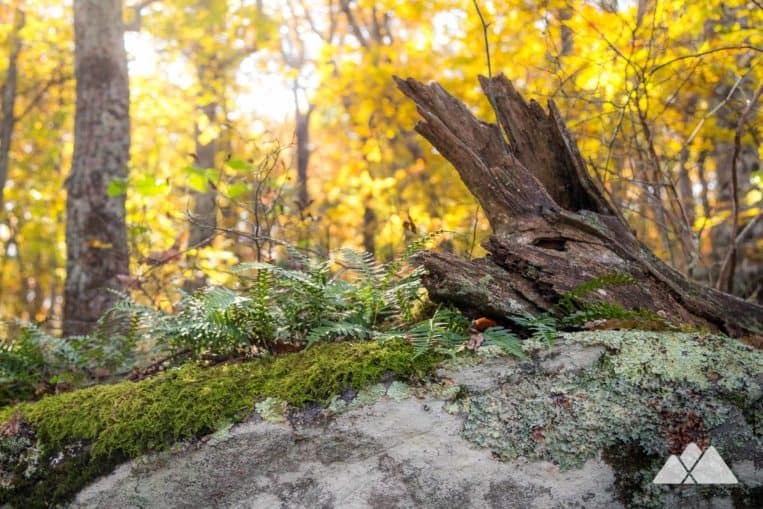 Hike the 8-mile Gahuti Trail to explore a waterfall, stunning overlook views and beautiful, rolling forest, and camp at one of the trail’s backcountry campsites. Or hike the kid-friendly, 1.2-mile Lake Trail, exploring the park’s sandy beach, campground, and beautiful, wooded lakeshore. And check out our Fort Mountain State Park destination guide for even more ways to stay, play, and explore this fantastic North Georgia outdoor getaway.